Hillcrest is a suburb in Durban, South Africa. It is part of the outer west suburbs of Durban. 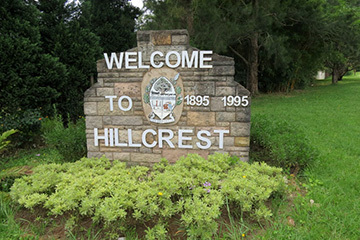 The suburb of Hillcrest experienced a building boom in the late 1990s and 2000s with the construction of many gated communities and shopping centres. The town celebrated its centenary in 1995 and has since then seen an incredible increase in inhabitants migrating from more central areas in Durban. Hillcrest offers a trendy urban centre with large shopping malls, a variety of restaurants, art galleries and thriving local community sports clubs. The Highbury School was the first school in the area, founded in 1903 by Mrs McMillian. The little wood and iron cottage for the school was leased from Horace Acutt, one of the pioneer settlers in the community. This page is proudly sponsored by Computer World , founded in 2004, with a core focus in mind. “To provide superior IT service, at the best possible price”.